If you've been to culinary school or maybe taken a food-safety class to become certified as a food service worker, you know all about FAT TOM. But home cooks can learn a lot by getting to know FAT TOM, too. Who (Or What?) is FAT TOM? FAT TOM sounds like he might be a big cuddly guy in a white chef's jacket who maybe comes around to your kitchen to help peel potatoes. Which would be great, wouldn't it? In reality, though, FAT TOM is a mnemonic device to help remember the six factors that contribute to food spoilage. "Food spoilage" means any change to the food that causes it to become either bad tasting or dangerous. The two aren't necessarily the same thing, although they're both caused by the growth of microbes like bacteria and mold. Still, you're not likely to get sick from moldy, smelly food, for the simple reason that you're (probably) not going to eat it. The real danger stems from certain bacteria called pathogens, which are the ones that cause food poisoning. These organisms don't produce any smell, discoloration, or any other changes you can detect with your senses. You won't even know they're there until you start to feel nauseous or crampy or whatnot. Since you can't see or smell these bacteria, it's important to store and handle your food in a way that minimizes the opportunities for them to grow. As it turns out, the most logical way to discuss these factors is in reverse order, but apparently, there is no decent mnemonic to be made from MOTTAF or even TMOTAF — at least not one as catchy as FAT TOM. Let's go through them one by one. Just like us, bacteria require water to survive, so moisture is one of the main factors related to bacterial growth. Foods like dried beans and uncooked rice will last for a long time at room temperature. Indeed, drying foods is one of the earliest known methods of food preservation. One common example of this is jerky. People have been preserving thin strips of meat and fish by drying for thousands of years. Sun-drying, air-drying, and smoking are common techniques for removing the water from food, rendering it inhospitable to bacteria. Curing foods in salt and sugar can also deprive bacteria of the water they need. They do this via a process known as osmosis. When applied to a food's exterior, salt and sugar pull moisture from the inside of the food to the surface, where it evaporates. Salt and sugar also bring on osmosis with the bacteria themselves — by sucking the water out of them through their own cell walls, killing them by dehydration. Another thing bacteria need is oxygen. Confit is a classical technique for preserving food from the era before refrigerators. Traditional duck confit involves cooking duck legs in duck fat, then storing them in a crock topped with a layer of fat. The solidified fat produces an airtight seal, depriving bacteria of oxygen. 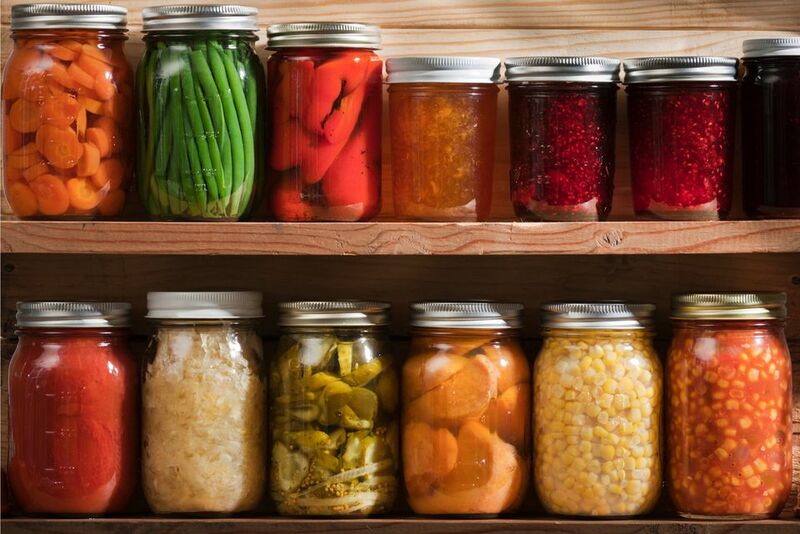 One of the most reliable ways of preserving food is by canning it, a process wherein air is sucked out of the container by steam pressure, which also seals the container shut. Home canning, whether it's done in a hot water bath or using a pressure canner, uses steam to create a pressure differential inside the jar relative to the atmosphere outside it, which vacuums out the air and seals it tight. In commercial canning, food is mechanically sealed in an airtight can and then heated. In both cases, the container is airtight — no oxygen gets in or out. And as we'll see next, the heating process involved with canning also helps kill dangerous microorganisms. Temperature is one of the key factors in bacterial growth. Bacteria prefer a nice moderate temperature. Too cold and they slow down, entering a sort of suspended animation in which they don't reproduce. They're not dead, they're just not making more of themselves. Or at least they're doing so much more slowly. Too hot and they get cooked, which kills them. Needless to say, killing bacteria is a very effective technique for preventing them from reproducing. As a rule, heating food to 165 F for at least 30 seconds is enough to wipe out any dangerous bacteria it might contain. The so-called temperature danger zone, the range of temperatures in which most bacteria thrive, extends from 41 F to 140 F. Your refrigerator or freezer will get you to 40 F and colder. For hot food, like on a buffet, you want it to stay at 140 F or hotter, which is too hot for bacteria. As long as it's first heated to 165 F, it's safe to hold hot food at 140 F. But if it dips below, you have to reheat it. Any food will go bad eventually, even if it's frozen or canned or made into jerky. But with preserved foods, we're talking about months or years. With perishable foods at room temperature, we're talking hours. Perishable foods (like fresh ground beef you just bought) can be kept at room temperature for only a very short time — no more than two hours in the aggregate. Meaning if you leave it out for an hour and then put it back in the fridge, that food can still only be out of the fridge for another hour altogether. It doesn't start over with a fresh two hours. This is because bacteria reproduce very rapidly under normal circumstances. They do so by splitting themselves into two identical selves, which they can do several times an hour, as can each new one. Thus a single bacterium can become millions in just a few hours. Ensuring perishable items aren't left out for more than two hours limits the bacteria's ability to reproduce. This is important because it's not just the bacteria themselves that can make you sick. In some cases, it's also the toxins they produce. You might kill the bacteria by cooking them, but those dangerous toxins will still be present. Or more accurately, pH level, which is a measurement of how acidic or alkaline something is. pH values are computed on a scale of 0 to 14, with lower numbers being more acidic. Water is considered neutral, with a pH value of 7. Foodborne bacteria prefer a pH level in the neutral to mildly acidic range. pH levels of 4.5 or lower are considered acidic and will inhibit the growth of bacteria. For example, lemon juice is around pH 2 to 2.5; most vinegars are in the range of 2 to 3; jams and jellies range from 3 to 4.5; and ketchup is 3.5 to 3.9. Generally speaking, anything with a pH value of lower than 4.5 does not need to be refrigerated. Pickling is a preservation technique that involves immersing food in an acidic liquid such as vinegar. Last but not least, food refers to the fact that bacteria need to eat something, namely, whatever food we're trying to keep from spoiling. And while fruits, vegetables, and starches are susceptible to bacterial spoilage, it's high-protein foods like meat, poultry, milk, eggs and seafood that can harbor pathogens. These are the foods we consider "perishable," which means they need to be kept in the fridge or freezer or preserved using any of the other techniques discussed above — pickling, smoking, canning, and so on. If it's an apple or an onion or a loaf of bread, you don't need to worry much about it. It'll go bad eventually, but you can keep it at room temperature. So that's FAT TOM. In theory, it's only necessary to control any one of these factors to prevent food spoilage. In practice, however, it's a good idea to focus on two or more. So for instance, with canning, oxygen is removed and the food is heated to kill bacteria.